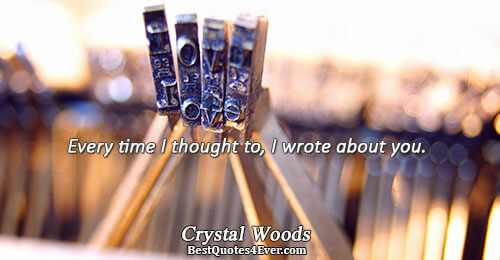 Every time I thought to, I wrote about you. 'None of them likes me back. I may as well like the one I really want. A hammer made of deadlines is the surest tool for crushing writer's block. Oh, he did look like a deity – the perfect balance of danger and charm, he was at the same time fascinating and inaccessible, distant because of his demonstrated flawlessness, and possessing such strength of character that he was dismaying and at the same time utterly attractive in an enticing and forbidden way. Every word you’ve ever said, is written somewhere in my mind. It's like I'm thirteen again and he's my crush. All I'm aware of in this entire roomful of people is him. Where he is, what he's doing, who he's talking to. Nico studied his face – his sea-green eyes, his grin, his ruffled black hair. Somehow Percy Jackson seemed like a regular guy now, not a mythical figure. Not someone to idolize or crush on. This isn't a crush, it's obsession.You are never not in my thoughts. Your scent carries across a room and paralyzes me with longing. I don't want to hold your hand. Part of me wants to set you on fire and hold you while the flame consumes us both, to eat your heart so I know that only I possess it entirely. Why are you limping like that?' Nicholas demanded. 'I'm swaggering,' I informed him. Charming. And I had a crush on this guy. I had a crush on this guy? 'Nothing,' I said quickly. 'Never mind. No more, no less. I'm an idiot. I really need to let this crush go. She felt powerless to withstand or deny him. He was altogether too much for her, and Bathsheba seemed as one who, facing a reviving wind, finds it to blow so strongly that it stops the breath. A beautiful girlfriend is worth two more. Here is the repeated image of the lover destroyed. about the blood in your mouth. I wish it was mine. I couldn't get the boy to kill me, but I wore his jacket for the longest time. I had a dream that I saw shooting stars with you. Two things that will come close to never happening: Seeing shooting stars, and being with you. I want me to be yours. How do I like to spend my day off? I like to hit up the juice bar, the bookstore, tan, and then flirt with the pharmacy tech at Walmart. Because he says he can't stand you and you act like you can't stand him, and whenever a man and a woman behave like that toward each other, it usually means something's going on. I hung a picture of him above my bed and learned by hand the internal workings of the female combustion engine.